Who better to play a small town underdog defense attorney than James Stewart? His Paul Biegler is indeed one of the classic screen lawyers, but he is not without flaws. However, his taste in music certainly is not one of them. Many reviewers considered Duke Ellington’s soundtrack an awkward fit for Otto Preminger’s courtroom drama Anatomy of a Murder (trailer here), but it arguably compliments Stewart’s character rather well, and it definitely swings. Viewers will have a chance to judge for themselves when Preminger’s classic film plays this Saturday at the Fordham Law Film Festival, with a post-screening discussion with director and film historian Peter Bogdanovich to follow. Biegler accepts a difficult client in Lt. Manion, a hard case Army officer with anger management issues, accused of murdering the man who raped his flirtatious wife. 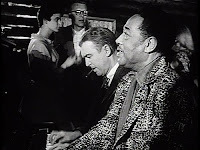 His investigation takes him to an Upper Michigan roadhouse, where Duke Ellington appears as the bandleader Pie Eye. Biegler even sits in for some four-handed piano, clearly proving he is indeed a jazz kind of guy. Anatomy is a film that deftly handles some very delicate subject matter, with the help of powerful performances from Stewart, Ben Gazzara as Manion, and Lee Remick as his wife, Laura. The majestic blues of Ellington’s soundtrack are completely at odds with our impressions of small town white America, but it is precisely this dissociative effect which serves the film so well. Viewers first meet Biegler driving home through his familiar town, returning late at night from a long fishing trip, as the Ellington Orchestra swings hard in the background. In effect, it sets Biegler apart from his community—an alienation any former DA reduced to scuffling for divorce cases is likely to share. The soundtrack for Anatomy is an enduring classic of Ellingtonia. Whether it is Johnny Hodges’ sweet alto on the suggestive “Flirtbird” or Cat Anderson’s high notes on “Upper and Outest” heard over the film’s ironic closing scene, Ellington demonstrates his inspired ability to compose for particular sidemen that marked his remarkable career. Anatomy is recognized one the finest jazz soundtracks ever, and the rest of the film is also quite good. Bogdanovich may have some fine insights Saturday night (10/17), but simply by itself, Anatomy remains a thoroughly entertaining legal drama.